Kyle Hartzell of BowlerX is our tester for the Storm Tropical Breeze Kona Blue/Silver Pearl. 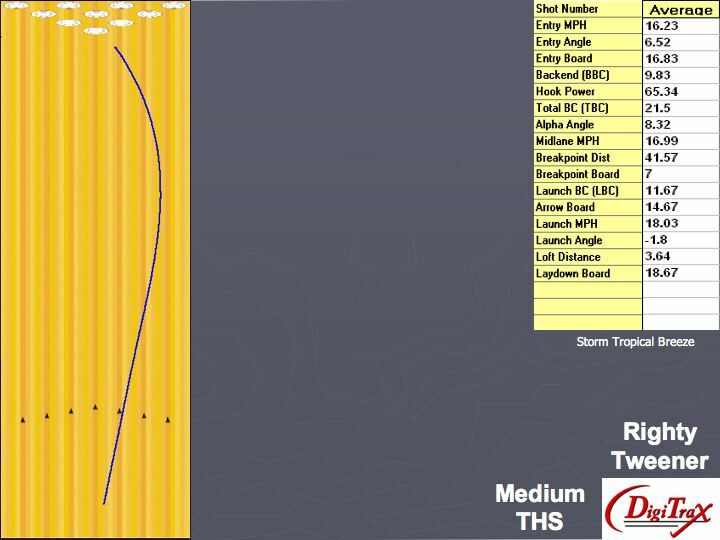 The testing was performed on a medium house tapered shot. Kyle launches the ball 18 mph and the ball enters the pocket at 16.23 mph. He’s targeting just inside the 3rd arrow out to 7 at the breakpoint of about 41.5 ft. Despite this ball being a lower end ball and an earlier, smoother ball reaction, it actually generates substantial entry angle. It averaged Just over 6.5 degrees for Kyle. The ball seems to drive pretty nicely through the pins. The ball comes out of box at 1500 grit polished. It generates comfortable length with a smooth transition and potent backend. You would not categorize this ball as a skid/flip reaction like the Tropical Storms were. It distinguishes itself from the Tropical Heats pretty nicely. It actually gets into a roll a little earlier and is smoother at the breakpoint. The Heats are stronger at the breakpoint. Another good ball that meets the exact intention of Storm’s marketing. It’s a perfect stepdown from the Tropical Heats. Don’t forget to check out the complete review and video of the Storm Tropical Breeze.